Cast: Kim Hee Ae, Kim Min Jong, Lee Da Hee, Son Ho Joon and Lee Ki Kwang. 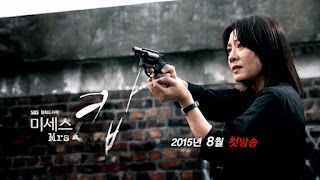 Choi Young Jin (Kim Hee Ae) is the squad head of her police squad, and close friend to the captain Park Jong Ho (Kim Min Jong). She is good at her job, and deals with some of the most brutal cases in the police station, but is also a single mother to her 6-year-old daughter, who is being taken care of by her aunt; Young Jin’s younger sister. When her chief and even higher ‘higher-ups’ want to make an innocent man go to jail, so the story about the actual murder can be hushed down, as it involves some politicians, Young Jin becomes furious and wants to fix I, but the entire situation, as well as her job, gets complicated, and she resigns. Hmm, I am not content with my summary, but I think I covered most of it. This drama is one of the funniest and coolest police dramas I have seen, and it’s not all that amazingly made. On a Korean crime/police/action rate, this one is up there with IRIS (the first one) and Phantom. I enjoyed almost every single bit of it, and the couple in the drama were one of my favorites in the year of 2015. Even though they had little romance, their chemistry was incredible – and funny! Or rather my type of funny… Just enough without being ridiculous (I’ve heard complaints about my humor… So you might not agree on it being a comedy). I liked all characters to be honest and I found the storyline good to. So hell year recommendable!